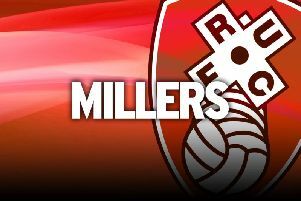 Rotherham boss Paul Warne is concerned his side have not been able to register the points he feels they have deserved. The Millers have competed well in the opening third of the Championship campaign following their promotion last season and have put in some impressive performances. They have had a struggle getting over the line in a number of games, though, and have amassed just 14 points from their opening 15 games ahead of this weekend's clash with Swansea. That leaves them just above the relegation zone and Warne knows his side's failure to cash in when they are playing well could be costly if a bad run comes. “I feel like the lads have given everything and we are still where we are, I have a fear of that, I look at the league table like everyone else,” he said. Still, the Millers are faring far better than last time they were in this league when at the equivalent stage they had won just seven points. Warne does not think the division is any easier this time around, just that he is squeezing the maximum out of his tight-knit squad. “I haven't found it easier because every point or three points you get is a bloodbath,” he said. “Everything is a struggle, I just think the lads have on the whole done exactly as we've asked. “The performances have been as close to the best we can be, any team can beat any team. Home games against Hull, Stoke, Bristol City and Bolton and away trips to Wigan and Nottingham Forest are all instances where the Millers dropped points. With those deserved points on the tally they would be in comfortable mid-table, a position Warne reckons is a truer reflection of their displays. “I think realistically most people find their way by this stage,” he added. “But I still think we should be four or five points better off than where we are at..
“We should be on level points with the likes of Villa and Brentford, which is impressive. “I don't see us as a bottom six team, I definitely don't and nor will I let the lads think like that.